Battle of Bull Run--July 21st 1861. Union (Gen. McDowell), Confederate (Gen. Beauregard). Kurz & Allison, Art Publishers, [1889, 1890]. Lithograph, hand colored. To see the location of a photograph in this section click on the circled letter, , at the photograph. On July 16, 1861, the Union army under Brig. Gen. Irvin McDowell marched from Washington toward Centreville, Virginia, on the Warrenton Turnpike. From there they planned to attack the Confederate army, under the command of Gen. Pierre G.T. Beauregard, and later Gen. Joseph E. Johnston. Afterwards, Mclean moved from Manassas to Appomattox in order to get away from the war and it was in his house at Appomattox that Lee surrendered. He could truly say that the war began in his front yard and ended in his dining room. The Confederate army was dug in behind a small stream called "Bull Run" which ran approximately from the northwest to the southeast crossing the Northern Virginia country side. 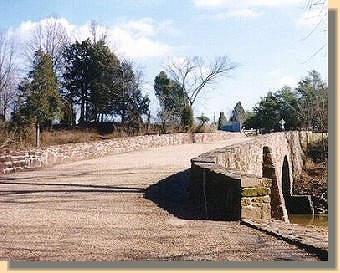 The Confederate line started at the Stone Bridge, where the Warrenton Turnpike crossed Bull Run, and followed the stream to the south for several miles. 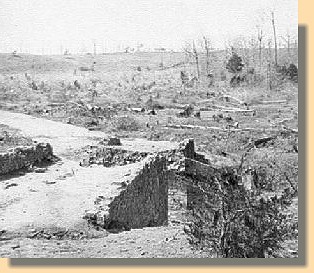 Two views of the destroyed Bull Run Bridge (Stone Bridge) in 1862. It's narrow size was disastrous to the Union Forces because of the logjam it caused when masses of troops tried to funnel onto it. Civilians, including Washington Congressmen, followed the Union army in carriages and on horseback on an outing to watch the Union army defeat the Confederates.